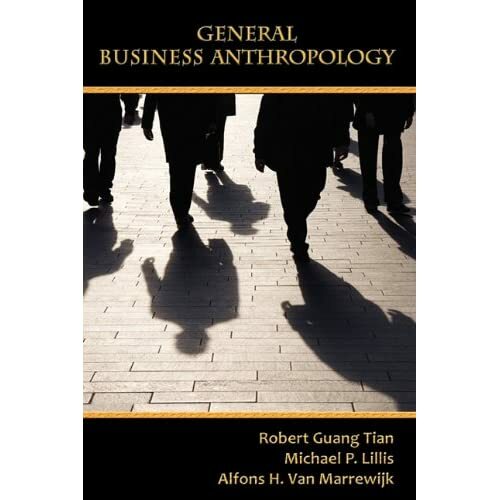 The roles and functions of business anthropologists have been widely recognized; in fact anthropologists are able to help solve most business problems in the real world and have made their unique contributions ( Jordan, 2010). Business anthropologist Timothy Malefyt recently (2009) discusses the changing public role of anthropology in last few years by exploring the rise of branded ethnographic practices in consumer research. He argues that a juncture in the “New Economy”—the conjoining of corporate interest in branding, technology, and consumers, with vast social changes—help to explain the rapid growth of ethnography for consumer research and predict its future direction. Business problems are various, for example, some of the business problems are related to the acceptance of new technical tools, methods, and processes by reluctant workers. Business firms that have workers with different educational, ethnic, and cultural backgrounds may face serious difficulties in creating a coherent organizational culture (Schwartz, 1991). Business anthropologists have been hired to investigate sources of trouble and to suggest remedies (Mars, 1994). In some cases, business anthropologists are able to help mediate and open communication between groups of workers and management (Reice, 1993). In practice, most business anthropologists play very different roles in the companies for which they work (Jordan, 2010; Marrewijk, 2010; Morais and Malefyt, 2010). Some focus on the products that businesses produce, for example, by helping businesses to develop attractive, salable products and to market these products successfully. While others focus on business organizations themselves, for example, by helping businesses to improve the efficiency with which they are run. No matter what their topical focus or employment status is, however, business anthropologists rely on the same methods other kinds of applied anthropologists use in their practice, especially participant observation, informant interviewing, focus groups, various survey methods, and network analysis (Aguilera, 1996; Corbett, 2008). They also research and analyze many of the same cultural variables as other anthropologists, such as beliefs and values, social structure, and gender-related behavior differences in organizations. In general, their work includes the same process and methods along with other kinds of applied anthropology (Marrewijk, 2010; Ybema et al., 2009). Margaret A. Gwynne (2003), an applied anthropological theorist, along with Ann Jordan (2003), a business anthropologist, places business anthropology as a subfield of applied anthropology. However, in Gwynne’s view there is a major methodological difference between business anthropology and other kinds of applied anthropology because in most cases the fundamental purpose of private sector economic activity is to make profit, and as such, there is always full of competitions in the business world. Moreover, because when working for highly competitive business firms business anthropologists usually face a difficult task in being “open” with results, publications, and sometimes must undergo through severe concerns about professional ethical questioning (Gwynne, 2003). The profit motive usually means that the “product cycle” of any given item produced by a business – the amount of time between the development and introduction of a product and its decline – tends to be relatively short. For this reason, research conducted by business anthropologists is usually of a much shorter duration and involves much fewer informants than research conducted by their colleagues in the academic world (Hafner, 1999). In the business world there are various approaches to the real problems that are mostly associated with people. The anthropological approach seeks to answer the ever-widening questions such as: “Why do people do what they do?” “What do they mean when they doing so?” Keeping these questions in mind we can further analyze the roles that business anthropologists can play, the functions that anthropologists can have, and the contributions that anthropologists can make to improve the business operations. (2010) suggests that business anthropology can be effectively divided into three fields: 1) organizational anthropology (the study of complex organizations to include their cultures, work processes, and change directives), 2) anthropology of marketing and consumer behavior, and 3) design anthropology (product and services design). While fully agree with Dr. Jordan, this author tends to add the fourth and the fifth fields, the fourth field can be termed as anthropology of competitive intelligence and knowledge management, focus on the study of unique methods by anthropologists to be used in competitive intelligence and knowledge management (Tian 2009), and the fifth field can be termed as anthropology of international and cross-cultural business (Ferraro, 2006; Lillis and Tian, 2009). In the following sections the author will briefly present the contributions that business anthropologists can make in the studies of corporative cultures, knowledge management, cultural audits, organizational changes, product design, marketing, consumer behavior, and international business with an additional section to discuss how anthropologists make their contributions (This is the introduction section of an article that I recently published in the International Journal of Business Anthropology, Vol. 1, No. 2). This statement appears to be more "ideological" rather than "scientific." Since when has the goal of business NOT to make a profit? As a cultural universal, human beings engage in economic activity. Throughout history they have sought to create or accumulate a surplus as an insurance policy against bad times. Such surpluses are "profits." In my experience, business organizations are a particular type of social structure created by individuals and/or groups of individuals in order to carry out and conduct economic activity for the benefit of the owners and their customers. Without profits, there is little reason or incentive to conduct business. However, I believe that there are a number of anthropological questions here that are far less "ideological" and far more scientifically interesting. For example: "what does "profit" mean in different socio/cultural contexts? ", "how does a business measure "profit" beyond "generally accepted accounting standards?" "how does a business translate its profit into "good will" or vis-a-versa? "Are there differences in the cultural criteria a business uses to value a business opportunity, and what are they?" This sounds like the subject for being blamed for behaving like the subject. What problems the business environment presents to the anthropological study of business are really the anthropologist's problem, not the business firm's. If one goes into an indigenous community and finds that they don't access to Facebook or Twitter so the anthropologist can not post her or his observations back to the students in the classroom, should the indigenous community be blamed? Business plans, marketing information, trade secrets and other intellectual property is proprietary. Intellectual property is legally recognized as having a true economic value to the business. Any anthropologist, academic or applied, should understand and accept this if they want to work in the business environment. Further, is there any ethical difference between the confidentiality one would extend the indigenous community and what one extends to a business firm? Why should the business anthropologist expect to be accepted into the business community, if the anthropologist can't accept the local rules over his/her vague "professional" ethics? Should there be a more realistic code that fits the business context that the business anthropologist can subscribe to rather than trying to fit the business into an ethical system based on academic principles of ethics? I recognize that this (competitor intelligence) is often the reason an anthropologist might be hired by a business firm, either as an employee or as a consultant. However, in the end, this raises the broader question. In American culture, at least, business is often referred to metaphorically as WAR.So, What is the difference between an anthropologist hired by a private business corporation to do competitor intelligence research, and the anthropologist hired by the military to do cultural terrain analysis? Is there a different code of ethics based on the identity of the client, i.e. a form of "racial" profiling? Or, should there be a different code of ethics based on the purpose of the activity bring carried out regardless who the client is? As you can see, you have me thinking. Good job! Again, thank you for the article and summary. Thanks for your good comments, which push me to invite you write an article for the International Journal of Business Anthropology. You have made three excellent, and yet, arguable, points: 1) what are the purposes of business firms (profits vs. nonprofits); 2 shall we (anthropologists) should adapt to the subjects’ environment (both nature and social) and rules or shall we blame the subjects for not share the same environment and rules as ours; and 3) how we deal with our professional ethic codes, shall we have our professional ethic codes tires to the subjects’ society or shall we must insist on our own. I believe each of these three issues is worth of debating and discussing among our colleagues. I would like to particularly invite you write something on ethic issues and using competitive intelligence as the case. Dr. Ann Jordan is in the position that we (anthropologists) should not involve ourselves into CI projects, while Dr. Alf Walle and I, among several others, believe that anthropologists do have the advantages in doing CI projects. I believe it is a very interesting topic to discuss and to debate among business anthropologists. I will be happy to take a shot at the ethics question. I have been dealing with the issue since the 1980's within the AAA/NAPA and later on a personal level as I've performed as a private consultant. Can you suggest the format and length etc. ?